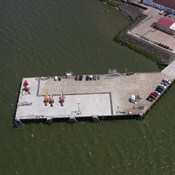 Construction of a new dock facility for recreational and commercial activities. The project consists of an "L" shaped fixed pier, a floating dock, and a series of mooring dolphins. 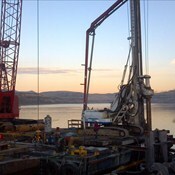 All steel piles on this project are drilled into the bedrock. 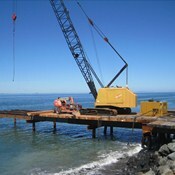 Construction of a marine outfall into the Straits of Juan de Fuca, including temporary work trestle, temporary sheetpile cofferdam, and underwater installation of an HDPE outfall pipe. 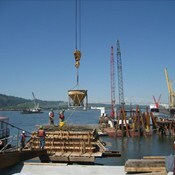 Design and construction of a new covered moorage facility for the Neah Bay Motor Lifeboat Station. 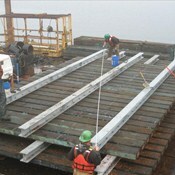 This project consisted of partial replacement of an aging timber and concrete pier used for the Coast Guard's buoy maintenance program. The replacement section consisted of new steel piles, steel pilecaps, precast concrete deck panels and a cast-in-place concrete topping slab. 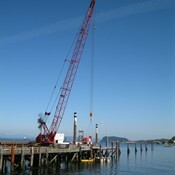 The pier remained accessible to Coast Guard vessels and shore operations throughout the construction process. 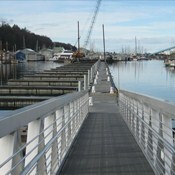 Replacement of an aging 210 slip marina facility including demolition and replacement of piles and floats, upgraded utilities and new pedestrian approaches. The project was phased over 2 years to minimize disruptions to marina tenants.